Boys Results | Girls Results | Photos Coming Soon! Abby Loveys continued to torch the trails, Sebastien Reed ran the fastest time of the day and of his career, and the Indian Hills girls, NJ #3 Colts Neck girls, and Ocean City boys turned in the top team performances at Saturday's Six Flags Invitational at Great Adventure in Jackson. Loveys, senior at Randolph, ran away with the girls A Division race in 17:39, nearly a minute ahead of runner-up Mary Hennelly of Suffern (N.Y.), second in 18:36. Loveys has now won all three of her invitational this season, and she's yet to be challenged. She opened her season by winning at the Warwick Invit. in 17:27, No. 3 in course history, and then she went 17:28 to win at the battle at Ocean County Park, No. 4 all-time on that layout. The next big one for Loveys is the Manhattan Invit. at Van Cortlandt Park on Oct. 13. In the boys competition, Reed, a junior at Pitman, took one second off his previous PR by winning the boys D race in 15:42 for his second straight big victory of the season. Reed ran 15:43 on Sept. 21 to finish first at the Osprey Invit. at Stockton. The top teams on the day were the Indian Hills, girls Colts Neck girls, and Ocean City boys. Junior Corinne Barney won the C race in 18:27, the third fastest time of the meet, to spark a 1-3-6-7-10 for Indian Hills, which averaged 19:33 and rolled to a 27-86 victory over Matawan. Indian Hills, which may not stay unranked for long after this performance, also placed second in the team merge, 112-115 1/2 behind Pearl River (N.Y.). Colts Neck was third in the merge with 160. 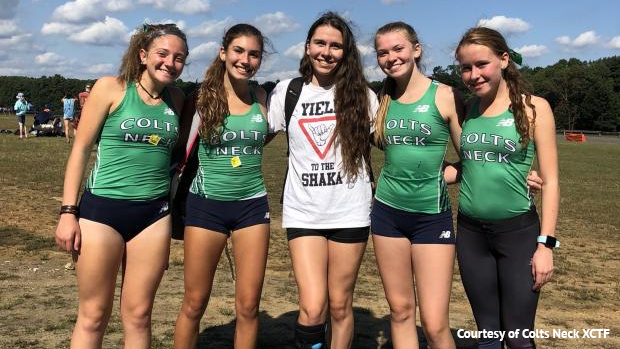 Colts Neck, led by runner-up Delia Russo (18:52), went 2-4-8-10-14 and averaged 19:51 to runaway with the girls B Division title, 38-78 over Ursuline (N.Y). Ocean City put three runners in the top eight and averaged 17:02 on the way to a 57-89 victory over Regis (N.Y) in the boys C Division race. Ocean City also came out on top in the team merge, 180-289.5 over Manalapan, the A Division champion.